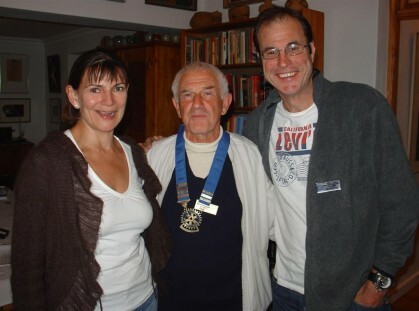 The Breede River Winelands Rotary Club inducted two new members this past month, Gabrielle Mattle and Bryn Evans (seen in the photo below with Club President David Hall when they received their Rotary Badges). It was a special event when Bryn was inducted as he is the club's first Associate Member, a new category of membership introduced by the club a month or two ago. Service Organisations are always on the lookout for prospective members of the community to join their club as the needs in our community are great and every bit of help is welcomed! Club Members have found that there are a number of enthusiatic people who like what Rotary stands for and the club's accomplishments to date, but that the expectations from 'full Members' are somewhat demanding of valuable personal time - the once-weekly meetings as well as the membership fees, etc. It is hoped that this new type of membership will attract many more interested volunteers to join this vibrant Rotary Club. It is much like a "Friends of Rotary" category with a project/s that is sure to appeal and suit new members who are willing to help where they can and with a project that is meaningful to them also. The Breede River Winelands Rotary Club's meetings are not "closed or private affairs" and members of the public who may be interested to attend any of it's meetings, are welcome to contact Club's Secretary, Sue Hall, or Club Services officer, Willem Scott. As the Club is representative of all 5 towns in the Langeberg, the meetings alternate in venue and town (usually held in either Montagu or Robertson).